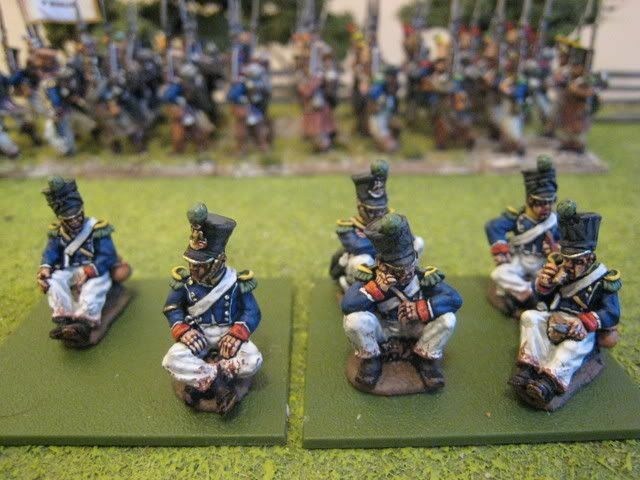 These are the Perry Miniatures "Young Guard resting on their packs" figures. 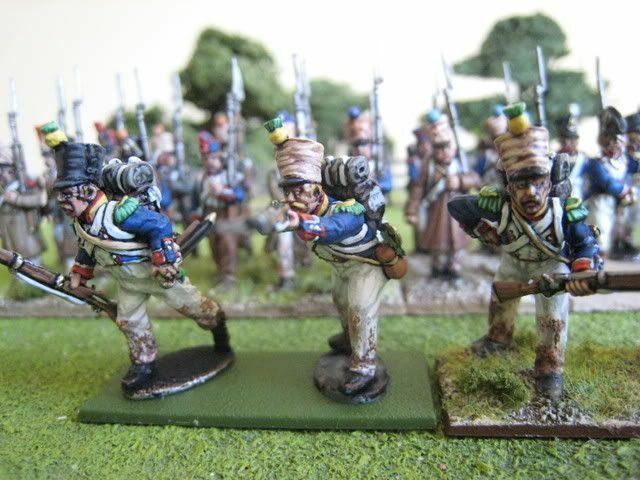 They are wonderful little sculpts, full of character, and I just couldn't resist painting a few up; it's packs like these that make it difficult for me to escape the lure of the Perry 1815 range. These figures are very much for decoration. I can't imagine anyone would use them in a tabletop "combat" situation, and I certainly don't intend to: I think you can just about get away with using "at ease" standing figures, but not ones that are sitting down. 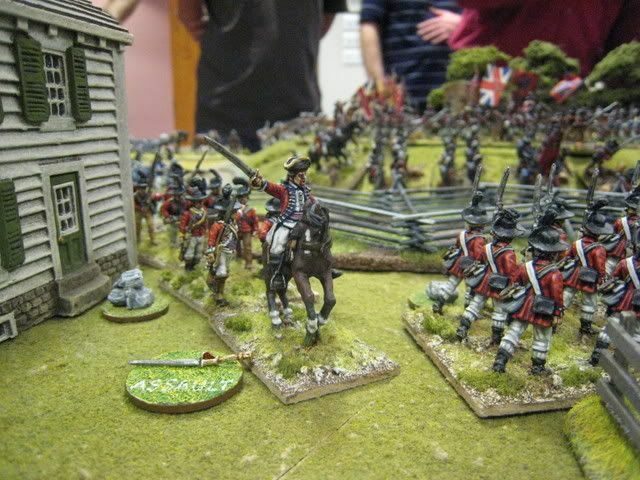 With hindsight, I wouldn't have placed the muskets on the ground, as you see here. 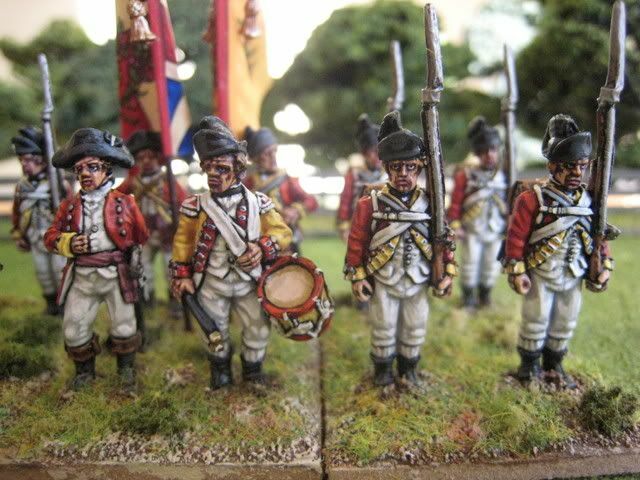 Since painting these figures I've seen other units where the muskets are tied together in front of the seated troops - that's more realistic and I would have done the same if I'd given this more thought! 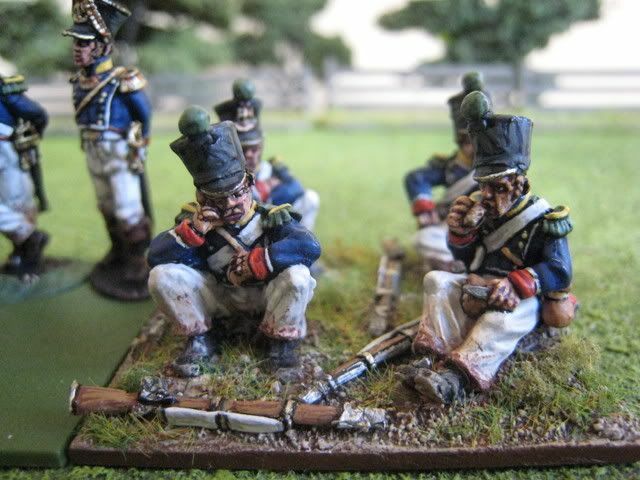 So the idea is that these figures will represent where Barrois' Voltigeur brigade is on the table whilst they are waiting in reserve. Once the regiments move into action, I would replace this unit with full regiments in a different pose. 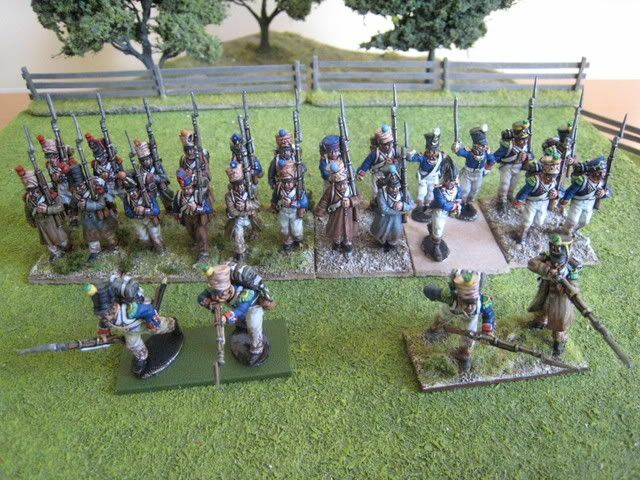 As these figures are largely decorative, I couldn't see the point of painting a full 1:20 regiment (the "General de Brigade" Waterloo orbat gives a total of 112 figures for the 1st and 3rd Voltigeurs!). I thought about painting 24 figures, but then settled on 16 on the basis that I just couldn't see the point of painting any more. After all, few Napoleonic tables are ever large enough to accommodate troops held in reserve anyway, as there is often barely enough space for those in combat. 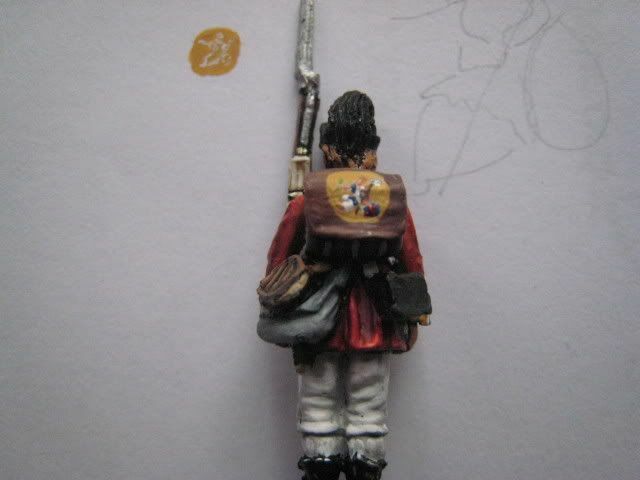 I have one figure left over, so may well at some stage paint up a similar 16-figure unit to represent the Tirailleurs. When I originally wrote this post the was missing its flag because I bought flags for the Tirailleurs instead of the Voltigeurs. I've now added a newer photo with the correct flag. 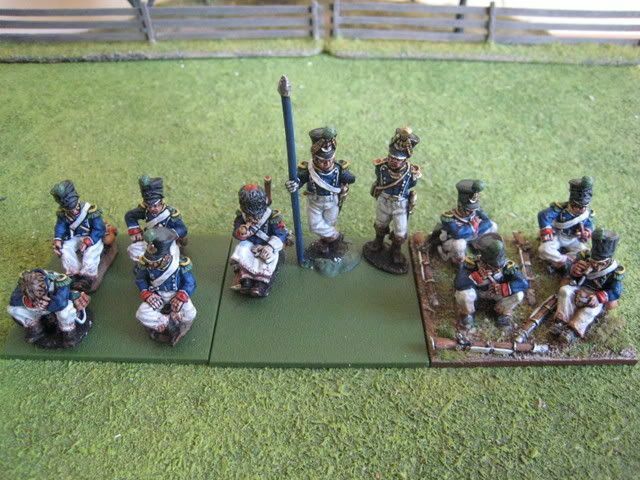 The figures are based on the larger plastic bases that come with the Perry plastic French infantry set. 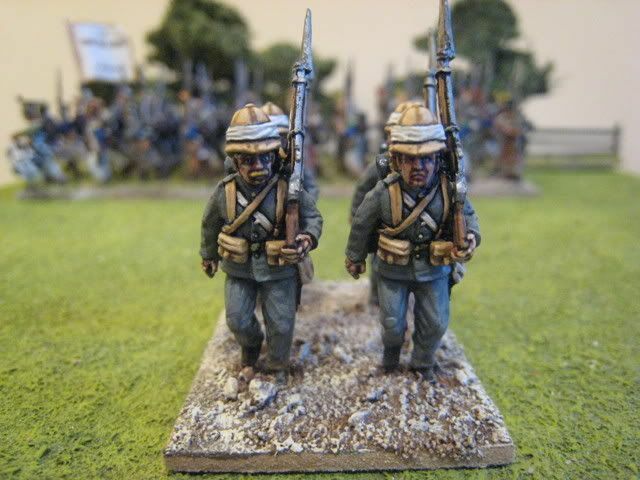 I had these left over as I'd based the 72eme Ligne in fours rather than sixes. 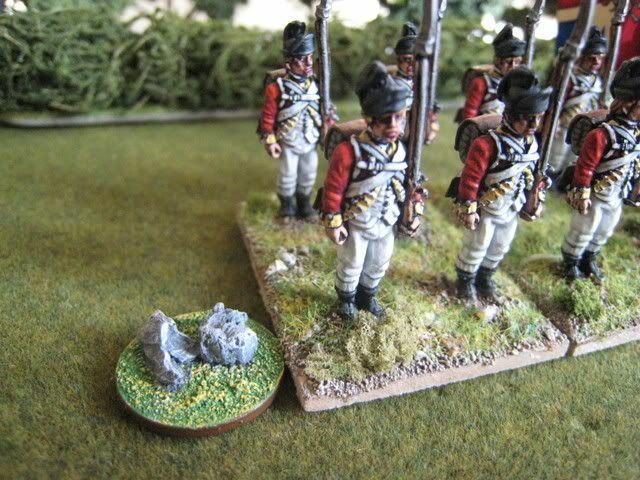 You need the larger bases for these figures as the muskets take up extra space. I am not a huge fan of green coloured bases, so I painted the edges of these ones with GW "Bestial Brown". 16 figures. Painted January 2009. 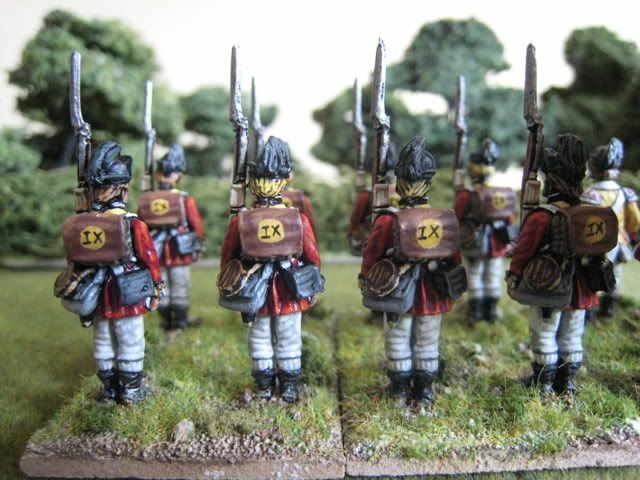 I've received a couple of queries over the past few weeks asking what I use for markers for "British Grenadier!" games. There are two types of marker that are important. First, a means of recording disruption points ("DPs"). DPs are accrued from movement and receiving fire; they represent a unit's disorder before it starts taking casualties. The number of DPs a unit has will be a minus modifier on things like melee, firing and morale scores. Once a unit reaches 3 DPs, it begins to take actual casualties (a unit will never have more than 3DPs at any one time). Secondly, a record of what orders a brigade is on - whether "engage", "assault", "hold" etc. This is important as a brigade's orders will often determine what the constituent units of that brigade must do. For example, if a brigade is on "assault" orders, then at least one unit must advance or charge towards the enemy in each turn; and, generally speaking, only units on "assault" orders can declare a charge. So players need to keep a close eye on what orders their brigades are on and ensure that generals are on hand to change orders as required. Most BG players will have experienced the frustration of trying to change a brigade's orders when your c-in-c is on the other side of the table. The BG rules come with printed order markers which can be used perfectly well as sold or in a laminated form. 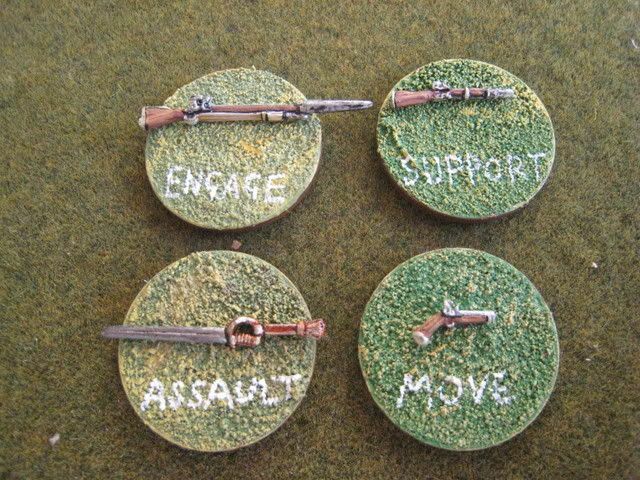 I created some more durable markers using two pence pieces and a variety of weapons, as sold by Front Rank. Each order has a designated weapon, such as a sword for "engage", a musket for "assault" and so on. The relevant order is then written in white underneath the painted weapon. I texture and paint the two-penny piece first. The colours for the base are, GW Goblin Green for the base coat, then dry-brushed highlights of Foundry "Ochre B" and "Ochre C" - not my standard base texture colours, but a combination that seemed right at the time. The Front Rank packs of weapons are relatively cheap and there is a decent variety to choose from - carbines, sabres and pistols in addition to muskets and swords. Texturing the base can make the white lettering go a bit wonky from time to time if you're not careful. It's probably most appropriate to attach the marker to the brigade commander figure. There are various ways you can do DP markers: different numbers of dots on a washer, a casualty figure with different numbes on the sides of the base etc. 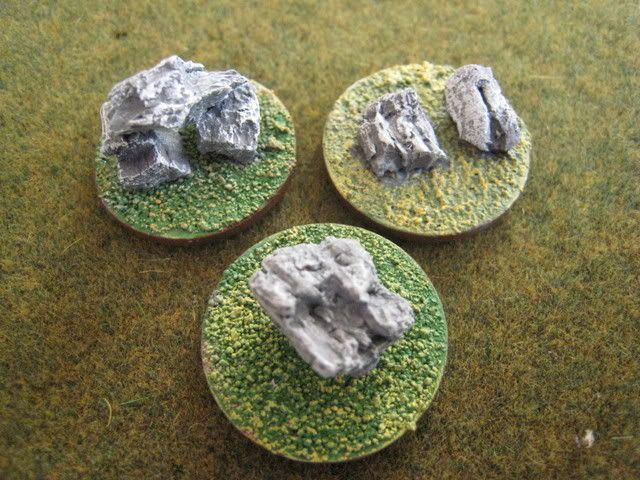 My method is to build little cairns of stones, using the same method as for the order markers: a lightly textured and painted/dry-brushed base (in the case of DPs, a one pence piece) with small pieces of cork added in ones, twos or threes. I forget the exact paint combination for the cork stones, but I used a GW grey for the base colour and then dry-brushed with a lighter grey and finally white. The bag of cork used came from Modelzone; the cork pieces are in various sizes, so large pieces can be used on 1 DP markers and the smaller pieces combined for 2 or 3 DP markers. 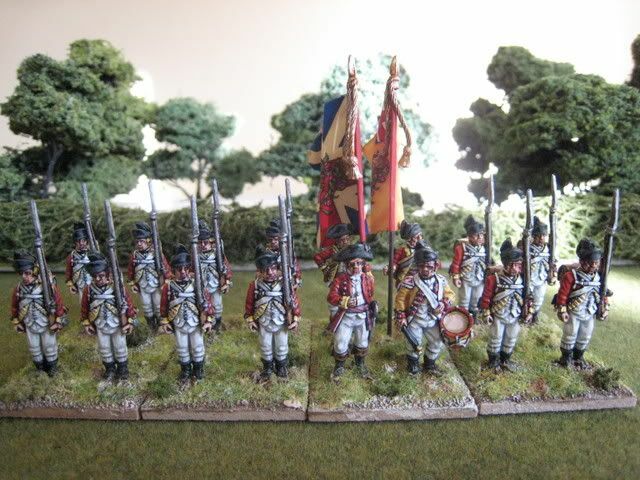 The 9th Foot is my last (of five) "Saratoga" regiments. The 9th was raised in 1685 as Colonel Henry Cornewall's Regiment of Foote. In 1751 it was designated the 9th Regiment of Foot and became The Norfolk Regiment in 1881. It was posted to Canada in 1776 and joined Burgoyne's campaign of the following year. One of the very few references to colours being carried in the Saratoga campaign is the story of how the 9th's commanding officer, Lt. Colonel John Hill, apparently removed the flags from their staves and hid them in his luggage after Burgoyne had surrendered at Saratoga. These colours were presented to King George upon Hill's return to England and allegedly remained in Hill's family's possesson thereafter. After my Napoleonic sojourn I am not back on AWI big time. On the works are 2 Continental/militia regiments and some Saratoga artillery. Posts of the last French Naps should be up fairly soon (and I will need readers' advice on the Young Guard Voltiguers...). 16 figures. Painted December 2008. Flags by GMB. I have reached one of those moments when I have lots of stuff waiting to be based but nothing finished to put up. Also, it is difficult to take decent pics at the moment because the light in London is very bad and it remains dark until after I have left for work, so all photos have to be taken under artificial light. So here, in the absence of anything else, are the current wip shots of the first battalion of the 72eme Ligne (actually now finished and in the basing process) and the Young Guard 3rd Voltiguers (the command base is now completed with a fifer and drummer). By the end of the week I should have proper posts on the 9th Foot and more British artillery for the AWI and the 72eme Ligne. 60-odd Sudanese Beja are waiting in the wings. - more Iroquois indians (12 figures - a mix of Perry and Conquest). Tarleton's Quarter celebrated its second year yesterday, and I'll use this at an opportunity to say a big "thank you" to everyone who reads this blog and posts comments. Ultimately all blogs are "egotistical" to a greater or lesser extent in that they presume that others are interested in what the blogger has to post, and so I've always been surprised at how many people think this blog is worth a look. I suppose the answer is that I myself greatly enjoy following other gamers' blogs, seeing what they are up to and hearing their musings on the hobby. Looking back on the state of the wargaming blogosphere as at 4 January 2007, there are now considerably more blogs and personal sites around; at times it seems that there cannot be too many gamers left who do not have a permanent internet presence, whether via their own blogs or as a regular poster on a forum. For people such as myself who are not affiliated to a club, and indeed for wargamers generally, this must be a Golden Age of wargaming cameraderie and information sharing. So what will 2009 hold for Tarleton's Quarter, aside from a month's closure whilst its barman heads off to the Pacific to get married? The AWI is still a core concern, but readers will know that I have been moonlighting with other periods since November and I confess that I am enjoying this. I'm not bored with the AWI by any means, but rather I'm acutely aware that marriage brings less time for painting and, whilst I'm not quite yet in the last chance saloon, I can't help but feel that my gaming options should be expanded beyond one period. I know I have said this many times before, but the recent Long Island game made me realise that there comes a point when you can have too many figures in a collection; and on reflection, that point is much closer than it seemed a few weeks ago. That said, the AWI is a large period and there are various gaps I need to fill: cavalry for both sides, more militia, a revisit to Howe's northern army to pick off some random British line regiments, lots more Hessians, anything new that Messrs. Perry or Eureka release over the next few months. So there is still much work to do, but I am going to dilute the AWI postings with appearances from other periods. At the moment, those periods will be 1815 and the Sudan. I hope hard-core AWI readers will forgive this indulgence... but at least it means I will be able to string out my AWI stuff for longer than if I spent all my time on it. 2008 was a good year, highlights being the Long Island game and seeing some of the AWI collection in "Battlegames" and Touching History book 4. On the painting front, the year's output is as follows: foot/cavalrymen - 438 (360 AWI; 52 French Naps; 12 Sudan Beja; 4 Sudan Brits; 10 ACW); horses - 17; carts & limbers - 7; guns - 6. So that's 468 pieces, which isn't too shabby (about 9 a week on average). 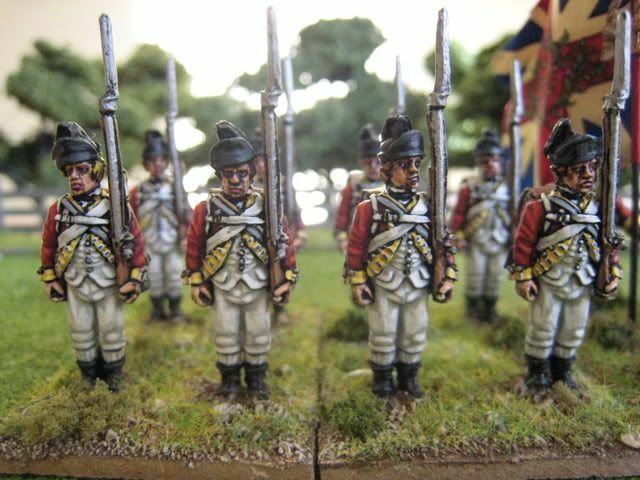 Above are a couple of wip pics - Young Guard Voltiguers from 1815 and the Royal Irish Fusiliers from 1885. Happy New Year!